I always take it as a good sign that as soon as a book comes out of the box, my eight- and ten-year-old sons grab them out of my hands and disappear for a long stretch of time. Such was the case with the delivery of the graphic novel interpretations of classic stories by Stone Arch Books. The box came in and the books were gone. 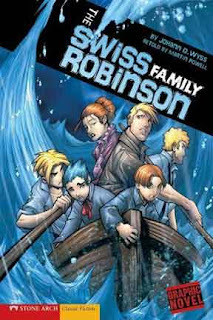 I later had to search around to gather the graphic novels back up and as I was doing so, one of my sons said that he just loved THE SWISS FAMILY ROBINSON (adapted by Martin Powell from the original novel by Johann D. Wyss). Then he asked me to read it to him, and so, the two of us went through the tale of the shipwrecked family of missionaries who find a new kind of peace, along with many adventures, on an island somewhere in the world. The story flows along at a brisk pace in this graphic novel version and the illustrations by Gerardo Sandoval really give a better sense of the creatures the family discover while trying to survive. For instance, the 40-foot boa constrictor that has been stealing their food and instilling terror in their hearts leaps right off the page when the family finally confronts the massive, vicious green monster. While my son was fully engaged with the story, though, I wondered about all of the narrative pieces that must have been left out when reconstructing a long novel into a short graphic novel. The plot moved along quickly, and for me, it was a bit too brisk. I wanted to know more (although, as someone who has read the novel, I already knew the answers to my questions). For example, the oldest son, Fritz, finds a girl castaway on the island, but we never really come to understand her character or why the two of them are attracted to each other. And the mother character is given little play throughout the book, even though she is a central character to the story itself. Something is gained by these graphic interpretations (i.e., kids are reading the classic stories that they might otherwise pass by), but something gets lost, too. I suppose the hope is that these introductions to the stories will later guide young readers to the novels, and the framework of the tale will allow for deeper reading of the original books. I do like how all of the graphic novels in this series begin with an introduction of the characters, since the narrative often jumps past basic character development (and my son could not figure out who the narrator was until we sorted out who might be the one speaking). The artwork for THE SWISS FAMILY ROBINSON maintains a Manga-like quality, particularly to the eyes of the characters. Sandoval is very effective in using the illustrations to fill in some of the narrative gaps of the story. And the sense of wonder and terror is expressed nicely on the faces of the characters throughout the story. A combination of dark and light gives the story a mysterious feel. The palette of colors used most effectively when the family is adrift on the ocean, with sharks closing in. The blue of the sea gives the reader a sense of the depth of isolation. Stone Arch Books is wise to include some related expository information at the back of these books that could be helpful to teachers in the classroom. In THE SWISS FAMILY ROBINSON, for example, there is a whole expository section on uninhabited islands and it gives advice to the reader on what to do if they are ever a castaway (main advice: find some coconuts for both nourishment and for making rope and insect repellent). There are a handful of discussion questions that talk about cooperating with others in the face of tragedy, identifying with specific family members and wondering why the mother and father would remain on the island even after the family is rescued. Also, for older readers, it might be nice to read the actual book and then compare the graphic novel with the original, and consider what choices went into what needed to be brought to the forefront of the graphic novel and what needed to be removed (and why). I would recommend this novel for a classroom collection or for a library and could be aimed for upper elementary and middle school readers. There are no inappropriate situations nor is there any profanity in this book.